Old map by PRYDE - Lyceum Don Quixote. Condition: Original lithography from the famous series "Les Maitres de L'affiche". Size of paper 290 x 400cm., size of image 225 x 220mm. In the bottom right margin the blind embossed publishers stamp. 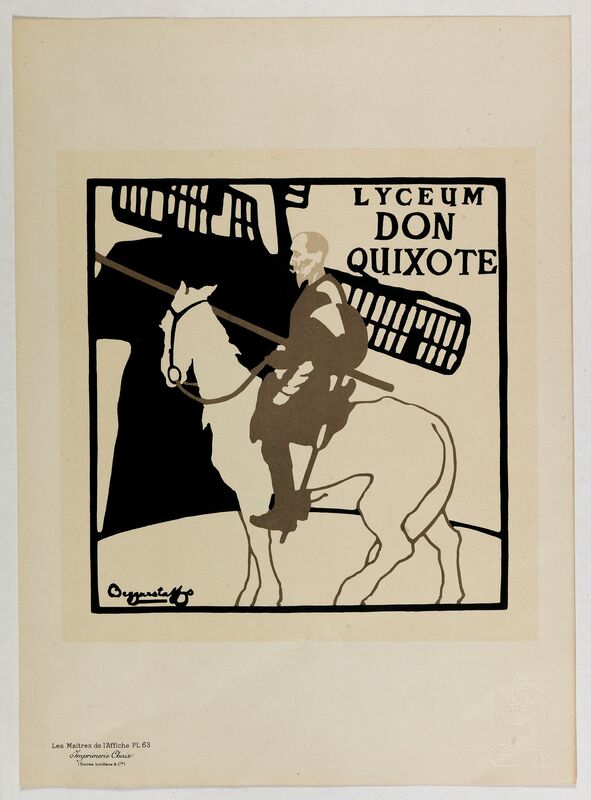 Chromo lithographed poster, "Lyceum Don Quixote. ", Plate 63, published in Maître 16, on March 1897. Signed in the plate with signature of "The Beggarstaffs", otherwise J. & W. Beggarstaff, was the pseudonym used by the British artists William Nicholson and James Pryde for their collaborative partnership in the design of posters and other graphic work between 1894 and 1899. They are sometimes referred to as the Beggarstaff Brothers, but did not use this name. The "Les Maitres de l'Affiche" contained 256 reduced lithographic prints of the best posters of the Belle Époque and was offered as a subscription series to collectors, from December 1895 through November 1900, subscribers received by mail monthly 4 loose sheets (Maître) with a cover sheet. Maitre's were never issued in a book form. The quality of the printing, in the "Maitres de l'Affiche," usually far exceeds that of their larger counterparts and was offered for sale at the price of an original poster. Read more about "Les Maitres de L'affiche".